Cathy the feather stitching looks like it belongs there! I would have never known it was an “oops”. Great idea! The ornament is beautiful. Thank you again – the tree’s going to have to go up early so we can hang it up! Such a beautiful piece. I would never have known the chart was altered until you said something. You did a perfect job! 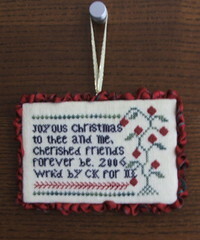 It’s a great looking ornament, and the feather stitch row looks just right to me! The fabric used for the trim is a nice match too. 🙂 You did a very nice job!